Art Teacher, Craft Teacher, Music Teacher, Staff Nurse and Librarian Jobs in Residential Schools of Telangana State. There are total 7306 Govt Teacher vacancies available in Telangana TSPSC Recruitment. Interested/ qualified candidates can submit applications through online via TSPSC Official website @www.tspsc.gov.in. Last date to submit online applications is on or before 04 March 2017. Starting date to register online application process is 10 February 2017. Selection for Telangana State TSPSC Teachers Jobs Recruitment 2017 will be held through Computer Based Online Exam/ written examination/ Preliminary Examination. For more details regarding vacancy details, Eligible criteria, no of posts, Age details, Exam syllabus, Pay Scale of this Telangana State TSPSC Residential Schools Teacher recruitment are given below. 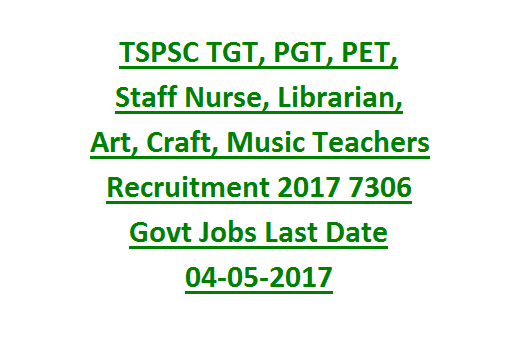 TSPSC online application starts for PGT, TGT Teachers is 18- 04- 2017. TSPSC Closing date to submit applications: 04- 05- 2017. Prelims Examination Date for PGT/TGT Teachers is : 28-May-2017. Mains Exam Will be conducted in June 2017 for Post/Trained Graduate Teachers. There are total 7306 Teachers vacancies are available in Telangana TSPSC Residential Schools. Department Name: Residential Educational Institution Societies. 1. Trained Graduate Teacher: 4362 posts. 2. Post Graduate Teacher: 921 posts. 3. Physical director (School): 06 posts. 4. Physical Education Teacher: 616 posts. 5. Art Teacher: 372 posts. 6. Craft Teacher: 43 posts. 7. Music Teacher: 197 posts. 7. Staff Nurse: 533 posts. Trained Graduate Teacher: Must have passed 1st class Bachelor Degree (BA/ BSC)/ BED 1st or 2nd class from UGC recognized university. Physical Graduate Teacher: Must have completed Master’s Degree MS/MSC in First class or its equivalent in concerned subject/ BED first or second class from an Institution/ university recognized by UGC. Physical Education Teacher PET: Must have qualified Intermediate Examination/ its equivalent Education/ Under Graduate Diploma in Physical Education. Art Teacher: Must have Passed Intermediate/ Diploma in Arts/ Bachelor of Fine Arts in Applied art or Sculpture or painting. Craft Teacher: Must have Passed Intermediate. Music Teacher: pass in Intermediate and Diploma/ Degree in Indian Music or 4 years certificate course with diploma in light music. Staff Nurse: Must have completed Diploma in Nurse Training course (GNM)or BSC Nursing or its equivalent. Librarian: Must have qualified Degree in Library Science from an institution/ University recognized by UGC. For more qualification details visit TSPSC official notification. Age limits for the current TSPSC recruitment vacancies is 18 years to 44 years and for SC candidates age relaxations is up to 05 years, PWD candidates is 10 years. Other Relaxation details are as per Telangana govt norms. Selection for this TSPSC Residential Schools Teachers recruitment will be based on written Examination (objective Type)/ Computer based Online Examination. Pay Scale for this Telangana TSPSC Residential Schools Teacher Jobs recruitment is as follows. Trained Graduate Teacher: Rs.28,940/- to Rs.78,910/-. Physical Graduate Teacher: Rs.31, 460/- to Rs.84, 970/-. Librarian: Rs. 26,600/- to 77,030/-. Staff Nurse: Rs. 25,140 to Rs. 73,270/-. See the TSPSC official notification for other posts pay scale details. For all candidates online Application processing fee is Rs.200/-. Examination fee for general candidates is Rs.120/- and for other category candidates is nil. Interested candidates having required qualifications may go through Telangana State TSPSC official website @www.tspsc.gov.in to apply online. Generate OTR one time registration number through TSPSC website. Log in with this OTR number and apply for the current TSPSC recruitment before last date.